Caroline and her three friends are taking on the world's toughest row, the Talisker Whisky Atlantic Challenge, this December. Every year, at least eight million tonnes of plastics leak into the ocean—that’s the equivalent of 6,341 plastic bottles every second. Once in the ocean, it’s broken down and ingested by fish and marine mammals, killing them and entering our food chain and tap water. 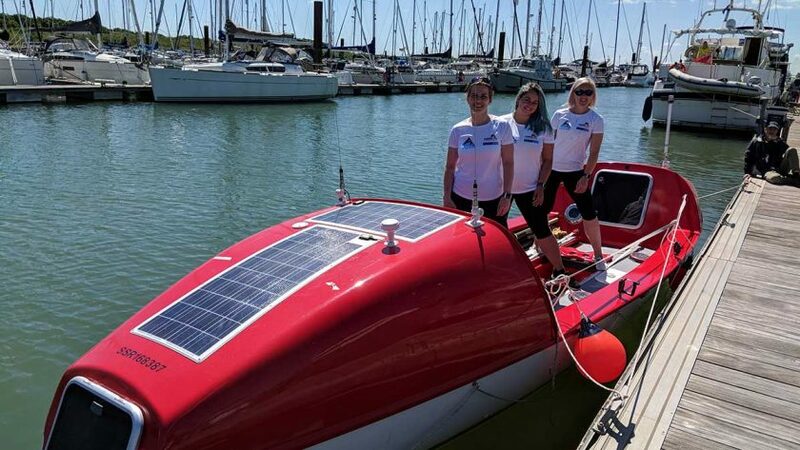 That’s why Caroline Wilson and her two friends Jess Rego and Susan Ronaldson have decided to ditch their office desks in London and row 3000 miles across the Atlantic Ocean. 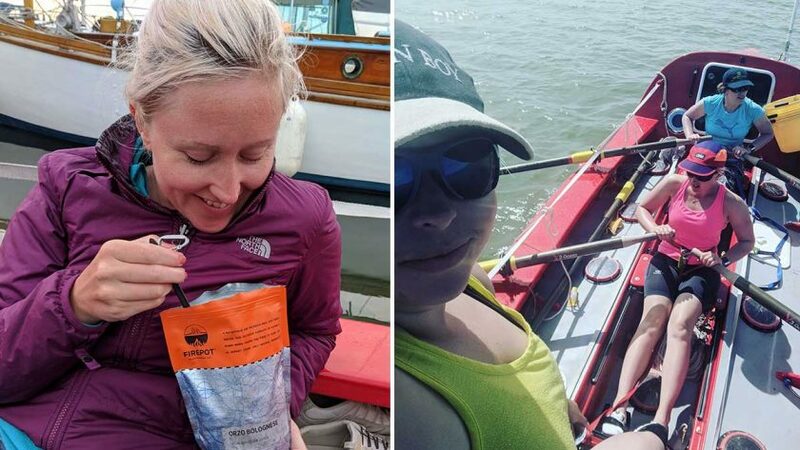 Despite having no previous rowing experience, the trio is taking on the world’s toughest row challenge, the Talisker Whisky Atlantic Challenge at the end of the year to raise awareness about ocean pollution. In doing so they hope to become the 2nd female trio ever to complete the challenge. I caught up with Caroline to find about how they are getting on, why they are doing the challenge and also about what vegan food and snacks will be fuelling her journey. 1. Tell us about Status Row. What’s it about? Status Row- Jess, Susan and myself, Caroline, are three women out to prove that anyone can achieve the extraordinary. This December we’ll be the second ever female trio to row 3,000 miles across the Atlantic. Carrying all our food and supplies on board, we’re taking part in the Talisker Whisky Atlantic Challenge, known as the world’s toughest row, and aiming to break the world record for the fastest trio. In making the crossing we’ll face 40ft waves, sleep deprivation, isolation, salt sores, and sharks as we row non-stop as a team, for ~50 days. Our mission, however, is greater than just the row. We’re working hard to raise awareness of the plastic pollution crisis, and help equip us all to take steps to reduce our single-use plastic consumption. If no action is taken, there will be more plastic than fish in the ocean by 2050. We are all responsible for what happens next. 2. How did you all meet and why did you choose this particular mission? Jess and I were colleagues and decided to try something new, so signed up for an indoor bouldering course back in 2015, and that’s where we met Susan. Each week for the next 3 years we’d meet up on the wall, our friendship blossomed even if our climbing skills did not! Susan had been brought to the wall by her 40 before 40 challenge, and her ongoing challenges inspired us to leave the climbing wall behind and see what else we could achieve. After learning about the race, it just clicked for Susan and I. Jess took a little more convincing, but once she realised the scale of the platform it would give us to spread our message, she was onboard. A big problem needs a big platform. The planet is one thing that connects us all and the synergy between saving the oceans and rowing across one fits our challenge perfectly. 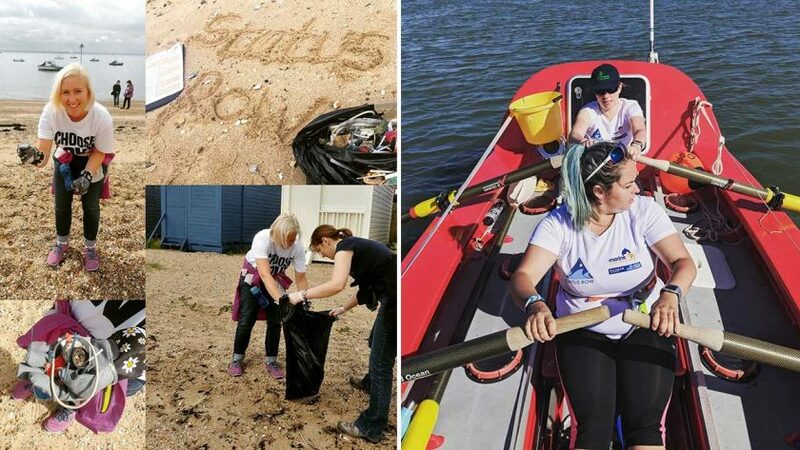 Like rowing across the Atlantic is only achievable by a series of small strokes adding up, solving the plastic pollution crisis can only be tackled when we all make small changes, together. 3. How are you preparing for the event? Have you had much experience of rowing before? Before signing up with this challenge, I’d not been on a rowing machine let alone a rowing boat! We’ve spent the last right months building up our strength and stamina in the weight section at the gym and building our endurance doing two hour-long sessions on the indoor rowing machine. One of the things we learnt quickly is that, unlike any challenges we’d taken on before, there’s so much more preparation to do than just the technical side of things. The first time we took our boat, Poppy, out onto the water we realised just how different the real thing is from the rowing machines. Learning how to work as a team to move the boat, and figuring out how to live on board a 7 x 2m boat certainly presents some challenges! Not to mention that we need to brush up on our engineering and electrical skills to become a jack of all trades once we’re out there. The row is unsupported which means we have to carry everything we might need with us and deal with any problems that come up – no matter what they may be. 4. Aside from actually rowing 3000 miles of ocean!! What do think will be/has been the most difficult aspect of the event? Getting to the start line is so much harder than we could have imagined. They say it’s 90% of the battle! Our entire lives have been turned upside down. We all have full-time jobs so in the evenings we transform into fundraisers, beach cleaners, public speakers, event organisers, social media fiends, logistic planners, first aiders, content writers, gym buffs and so much more! To take part in the race we need to raise a significant amount of money which we’re doing through a combination of corporate sponsorship, donations and our life savings. Deadlines loom ever closer and there’s constant pressure to reach the next financial target in time, or risk not making the start line this December. I am incredibly proud of where we are today. These girls have become an absolute rock in my life and it’s a true testament to what friendships can achieve that we’re in this position today. We’ve grown as individuals, pushed ourselves way beyond our comfort zones, and discovered parts of ourselves we didn’t know existed. We’ve met some mind-blowingly generous and supportive people along the way, and I count my lucky stars each day. 5. What vegan foods and snacks will you be taking with you? And what have you been eating during training? Whilst we’re at sea, we’ll be burning between 6,000 – 8,000 calories a day! 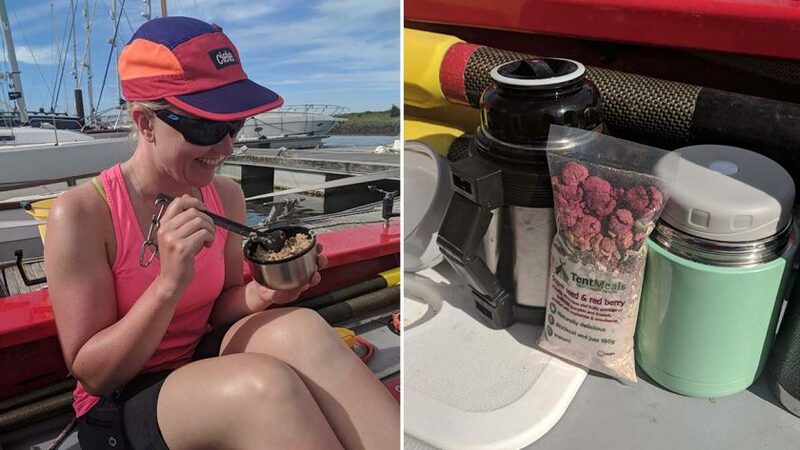 Luckily the variety and quality of vegan dehydrated meals had improved greatly over the last few years, with companies like Tent Meals and Outdoor Foods coming onto the market. But even with 4 meals a day we’re going to struggle to take on enough calories, so supplements like protein shakes and snacks are incredibly important! 6. What do you hope to achieve from accomplishing the race? I really want to challenge perceptions. I want to prove that you can achieve anything if you take a positive approach and put your mind to it. I want to prove that asking for help can get you far – we couldn’t have got as far as we have without friends, family and sponsors and we’re positive we’ll go all the way with these wonderful people behind us. I’d also like to challenge the perceptions of what can be achieved on a vegan diet. I’m confident it’s 100% possible to complete one of the world’s toughest challenges in a nutritionally balanced, ethical and sustainable way. 7. If you could make/change one law to help protect the planet and oceans, what would it be? It’s a really complex problem with a lot of moving parts, there’s no one solution to such a problem. But we can, and must, all be involved in helping to affect change. From forgoing plastic straws, bags and coffee cups for sustainable alternatives to making your voice heard to companies big and small. If we show solidarity in numbers, change will always follow. 8. And finally, what’s the soundtrack of your mission going to be? This might be the only thing the team has yet to agree on! It’s going to have to be a diverse mix. Motivational music for the rough patches, serene for epic sunsets and nights full of stars, and the downright cheesy for when things get tough and we need a pick me up. Nothing is off the table at this point! I wish the best of luck to these amazing girls and make sure to follow their journey through their website and Instagram.